The most recent U.S. Presidential Debate was a distressing experience for a lot of us. The candidates barely touched on some key issues because of the many distractions from Donald Trump. One exception was the segment on Syria, which included disagreements on the real culprits and solutions. Beyond the futility of the arguments, what bothered me was recognizing how little I know about that situation. I realize the situation is awful for the citizens, but it still feels distant because it’s happening on the other side of the world. This understanding led to my interest in The White Helmets, a new documentary released by Netflix in September. The 41-minute film by Orlando von Einsiedel (Oscar-nominated for Virunga) drops you into the action in cities that have become dreadful war zones. The story opens on a black screen, and the only sounds we hear are bombs exploding and people scrambling for cover. Even without visuals, the horrors of war are clear. The first-person view from shaky handheld cameras immerses us in the chaos. It’s a cold open straight out of an action TV series, but the stakes here are very real. It’s disorienting and frightening; there’s no logic to this hellscape. The cold open lasts for a short time, but it makes an impression. There’s no slow build-up to an expected climax. Einsiedel wastes no time showing daily life in Aleppo, a place with no sanctity from the threats. People are constantly looking to the sky and keeping their ears open for the sounds of rushing fighters. Working with brave videographers on the ground, Einsiedel gives us a rare glimpse at the destruction in Syria. The film’s title refers to the organization that works to protect civilians from the bombings. The White Helmets spend their days pulling kids and other people out of the rubble and risking their lives in the process. Formed in 2013, this group includes 2,900 civilians in 120 locations. It’s a large operation, but there’s only so much they can do against weapons of destruction. We see injured kids, dead bodies, and widespread carnage. The environment feels more like an apocalyptic film than anything that’s possible in our reality. I’m a dad with two young girls, and it’s impossible not to imagine them here. There are shots of kids their age crying and dealing with serious injuries. I could envision my three-year-old daughter running in the streets, and it frightened me. A boy cries over his dad, and it’s a tragic scene. There are positive moments, however. One high point is the rescue of an infant that’s less than one month old. Trapped under the rubble for 16 hours, this “miracle baby” actually survived. That type of success motivates these guys. Their efforts seem futile on days with more than 200 airstrikes, but victories are possible. Seeing that baby as a toddler near the end reminds us why the risks are worth it. The surprising part of The White Helmets is how much time we spend in Southern Turkey. The story focuses on three group members — Khaled Farah, Abu Omar, and Mohammed Farah. Their month-long training course in Turkey is the film’s centerpiece. I suspect this choice is practical; shooting too much in Syria could be deadly. It also reveals a sad undercurrent to their training. For these guys, it’s worse to watch the deaths on TV. They’re powerless to do anything and most hope their loved ones survive. One guy sits paralyzed by the phone and waits for news that his brother has died. The biggest challenge is maintaining hope from afar. Despite the heroic efforts of the White Helmets, a prevailing gloom pervades this film. When the Syrian regime (and probably the Russians) targets hospitals in airstrikes, we’re entered new territory for war. There are no rules to this conflict, which is destroying the country and killing hundreds of thousands. The scenes in Turkey are a little repetitive, but they do show the bond among this group. These guys once were blacksmiths and tailors, but now they work to save all they can. The prevailing theme that “life requires sacrifice” pervades their efforts. These men (no women are present, sadly) have lost friends yet keep pushing forward. The final shot in The White Helmets shows the men running back into the fray in Syria. They’re better trained and ready to make a difference. It’s interesting to note that it doesn’t matter who are the culprits of each violent act. The Russians are just another enemy inflicting destruction. Buildings are flattened and people are lost while the perpetrators fly away. What can anyone do to stop that type of attack? Einsiedel boldly presents the horrors of modern warfare. Airstrikes are clean in theory, but the bombs don’t only choose enemy targets. Our presidential candidates may have ideas to help in theory; whether anything can resolve this mess is another story. 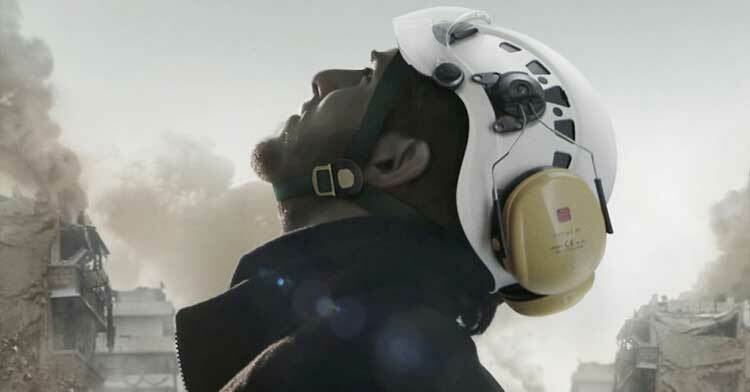 The White Helmets is currently streaming on Netflix. To learn more about the White Helmets organization, check out their official website.